when you’re looking for something small, not-overly-sweet, but will still make you smile – then these doughnuts are for you. 3. combine sour cream, eggs, honey, butter, vanilla, and mashed apples stirring well with a whisk. Add the sour cream mixture to flour mixture; whisk just until combined. 4. spoon batter into doughnut pans, filling two-thirds full. Bake in middle of oven until doughnuts spring back when touched and are golden on bottom (about 8 minutes). Let cool in pan slightly (about 4 minutes); turn out. coat with toppings (some ideas below), and enjoy. note: I used a mini doughnut pan and this recipe yielded 4 dozen mini doughnuts (with some extra). the original recipe with a regular size doughnut pan yields 14 servings. 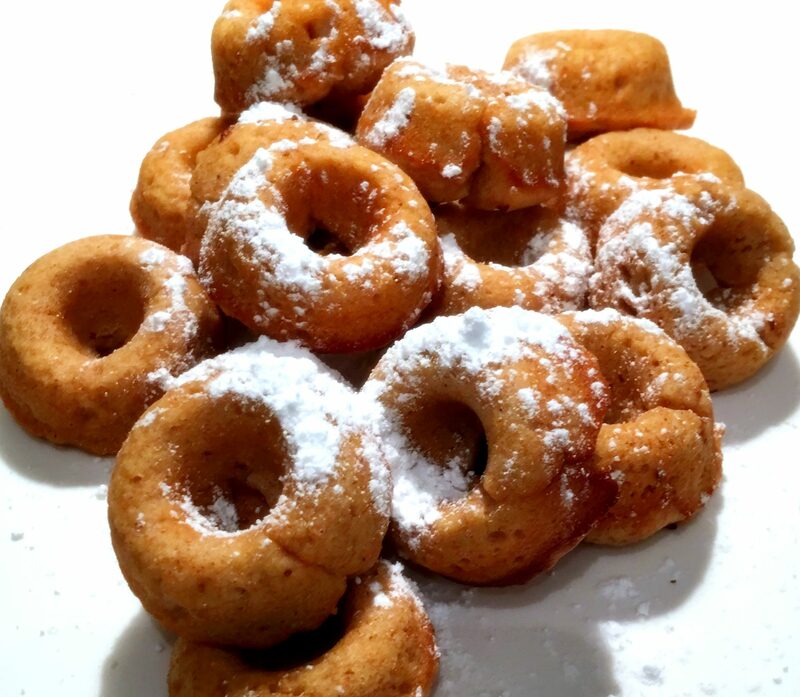 powdered sugar: fill a small bag with powdered sugar and coat doughnuts while still warm. cinnamon sugar: combine 1/4 cup ground cinnamon and 1/4 cup sugar. while still warm, coat doughnuts in melted butter – then transfer into sugar and cinnamon mixture. let cool on rack, sugar-coated side up. chocolate: melt 6 ounces bittersweet or semi-sweet chocolate in a bowl in microwave until smooth. 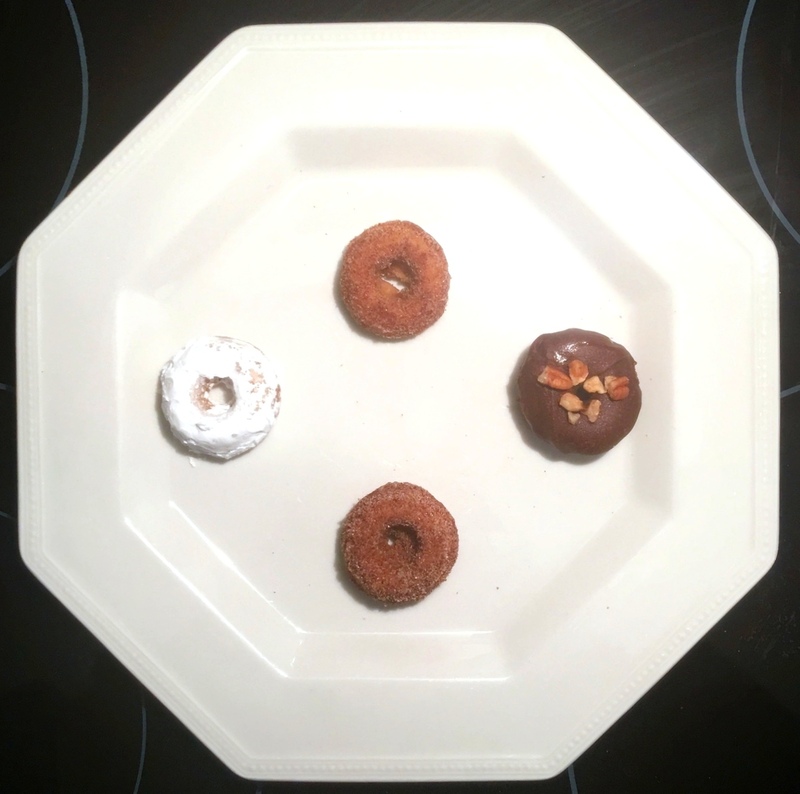 dip doughnuts into chocolate and place chocolate side up on a rack to cool. Sprinkle with 1/2 cup chopped hazelnuts; let sit about 10 minutes.